Uveitis is classified by the location. If the inflammation affects the “white” part of the eye, or sclera, it is known as scleritis. If the inflammation affects the front part of the eye, it is called iritisor iridocyclitis. 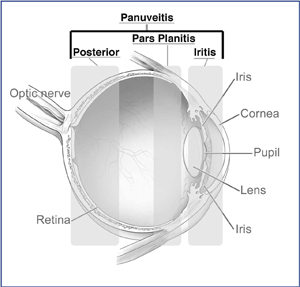 Inflammation that affects the middle part of the eye is known as pars planitis orintermediate uveitis. Inflammation that affects the back part of the eye is known as a posterior uveitis. Finally, inflammation that affects the whole eye is known as a panuveitis. remember to shake the bottle to mix the steroid as the drug is a suspension. If you don’t mix it, the drug just sits on the bottom of the bottle with none going into the eye!